Ocean Harbor House has ocean view condominiums for sale in Monterey that front the Monterey Bay. Del Monte Beach stretches before, and along side you. If you want an ocean view home in Monterey and want to be steps to the beach, you can't get a closer location than this. 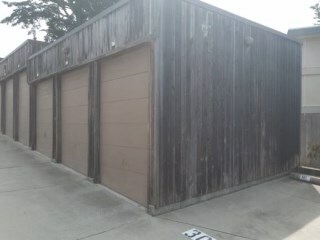 This 2 part development is located at #1 Surf Way and #125 Surf Way in Monterey, California, 93940. Read more about these ocean view condominiums for sale in Monterey, below. If you live here, you'll hear the crashing surf, smell the fresh salt air, and have no excuse for not having a walk on the beach each day. 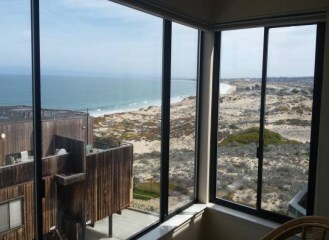 Here, every day is a vacation, for those who choose an ocean view condominium for sale in Monterey. Call it home, make your dreams come true ! The Ocean Harbor House ocean front condominium development in Monterey consists of 172 units. About half the complex front the ocean, and the other is one parcel back. Because they have different views, the price for the HOA and units are different. 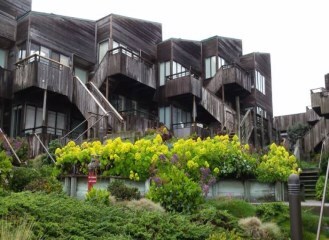 These Monterey condominiums have varied architecture of natural wood and range from one bedroom units of approximately 500 square feet to two bedroom units just over 1200 square feet, and some rare 3 bedroom units that are approximately1700 square feet. Some units have a covered garage, but most have covered parking. Both complexes are gated. There are upper and lower units. The upper units have vaulted soaring ceilings in the living room, and the kitchen, which opens to it, it's light & bright. One of the unique features of these units is that they are located steps to the sand and sea. Some units feature lovely ocean views, while other have that, and Monterey city light views. 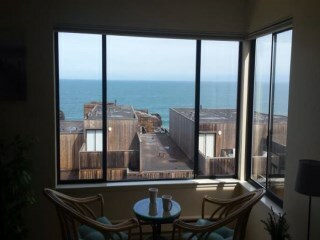 Some units located on the east side of the complex have lovely views over the dunes and up the coast. 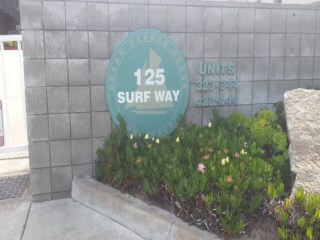 The #125 complex generally has larger decks, whereas #1 building have closer ocean views and more stairs. You can relax on your deck and see dolphins near the water's edge and the occasional cruise ship that visits the area. This luxury complex includes 2 heated pools, fitness room, club rooms, game rooms, sauna, spa, car wash area. 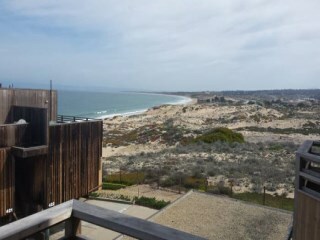 Living in this Monterey ocean view condominium will afford you the opportunity to experience life in Monterey. From Ocean Harbor House condominiums, you're within walking distance or a short bike ride to the pier for dinner or downtown. Waking up to stunning views of the Monterey Bay to winding down your day, with a glass of local wine, watching the sunset fade and then enjoy the city lights,it doesn't get much better. Search other condominiums on the Monterey Bay from Carmel to Santa Cruz.